When you're a leader you keep moving forward. And that's how you create products like the Moultrie deer feeder Unlimited. At the heart of this innovative feeder is our NXT Hunter feeder kit. Featuring an adjustable Funnel for smooth operation with multiple feed types and feed sizes and a new cake-free spinner plate design, the NXT Hunter even has the ability to Fix itself. Our backspin technology senses a clog or jam then counter-rotates the spinner plate to break up the clog. An easy set digital timer on an Extendable cord provides hassle-free programming of up to six daily feed times. The electric varmint guard uses our low-drain circuitry to help prevent animal intrusion and frequent battery replacement. The feeder kit connects to the 30-gallon hopper using Moultrie simple and secure quick-lock system. 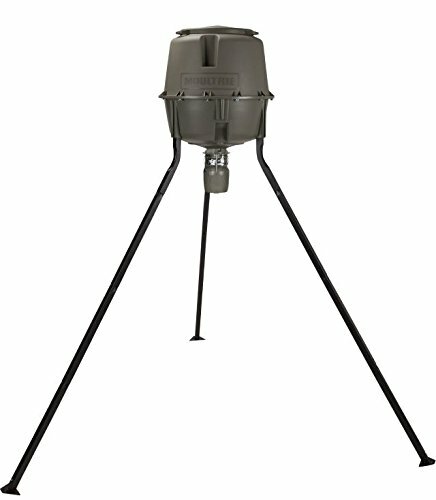 For additional versatility, the feeder includes additional leg sections so you can adjust height from 5.5 to 8 feet. The deer feeder Unlimited requires one 6-volt battery, not included.